Three From Spurs FA Cup ouster: Rotation, Rosicky and Injuries. Arsenal progressed to the FA Cup 4th round after a wonderful display over North London rivals Tottenham Hotspurs at the Emirates. Serge Gnabry laid up Cazorla to break the deadlock in the 1st half before Rosicky robbed Rose at the center racing on to chip Hloris at the hour mark. The injury list seem to have increased in the last 2 weeks. Giroud, Gibbs, Ramsey and Bendtner joined the list with Wilshere, Rosicky seemingly ill. Ozil’s mysterious shoulder injury gave another twist. In came Fabianski for Szczesny, Monreal for Gibbs, Vermaelen for Metersacker and Gnabry had a start. Fingers were crossed seeing Walcott as the man upfront but the interplay between the English man and Gnabry was good. But the rotation paid off. They didn’t Ozil or Ramsey or Szczesny. They were just fine spoiling the Spurs. A clean sheet for Fabianski, an assist for Gnabry and a goal each for Cazorla and Rosicky. With 9 days to rest, the squad should be full and wenger will have more headaches regarding selections. Is Rosicky 33 or 23? Tomas Rosicky was a thorn in the Spurs defence. Tackling and racing around the whites was rewarded with a goal. Rose will easily forget his wonder strike after he was robbed by a much older Rosicky. 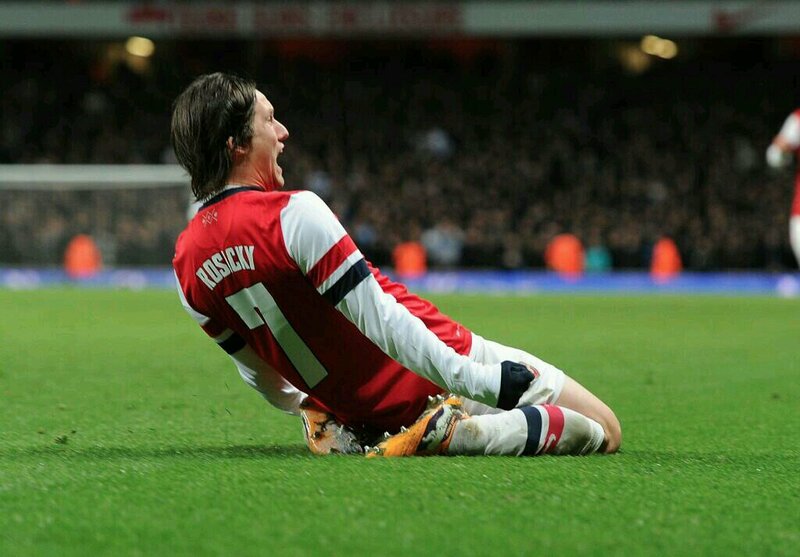 Rosicky plays like a 23 year old that have never been injured. He plays as if he owns Arsenal and would die for it. It is high time Wenger gives him another contract. The Czech wants to retire at the Emirates and a legendary status awaits him. He was a handful for the spurs and he is an oiler of the Arsenal engine. Thomas Vermaelen had a chance to captain the side but could only play the 1st half after getting an injury. He also had a yellow card for his troubles. Theo Walcott was stretched out in the last 10minutes. Wilshere was subbed after so many tackles. All these adds to Wenger’s worries and the fans hope for a strong side in the next game. Does Wenger need a striker? No Giroud. No bendtner.